Halogen or Quartz Lamps are a good choice for small areas. However, their operating and maintenance costs are higher than High Intensity Discharge lamp sources which include: metal halide, high-pressure sodium or mercury vapor. 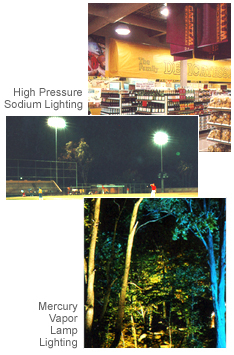 Metal halide lamps produce a bright white light and are commonly used in stadiums and grocery stores. High-pressure sodium lamps produce a warm golden light that is especially attractive on historic buildings and homes with warm exterior colors. 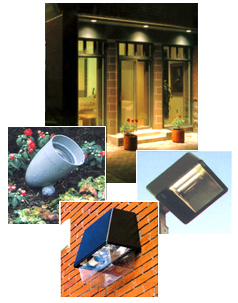 Mercury vapor lamps, the least efficient of the HIDs, cast a bluish glow that brings out the blue and green in plants. HIDs have lower operating and maintenance costs, but are usually more expensive to purchase.